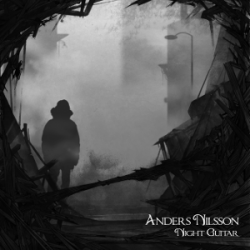 Anders Nilsson cites fellow guitarist Raoul Bjorkenheim's solo guitar album Apocalypso as well as solo works by John Mclaughlin, Sonny Sharrock and bassist Ken Filiano as inspirations for 'Night Guitar,' his collection of solo pieces for electric guitar. The songs feel as spontaneous as they feel composed, and contain an air of mystery and exploration. In the liner notes he admits "my desire is to create an atmosphere and a tension, which trigger the individual mind to create its own storyline." And so he does by overdubbing his Les Paul to construct layered compositions. The mood of the album is well encapsulated by the albums title and post-apocalyptic art work. Drawing on swampy blues forms well as more abstract and free form song shapes, Nilsson creates an aural world of darkness. The opening tune 'Meet me in the Back Alley' starts quietly like a soundtrack to a movie, envoking images and feelings. Suite-like, it morphs and changes along the way to end with a finger picked blues. 'Ax to Grind' is an effects laden affair with sharp angles and dangerous edges. Swirling about in arpeggios and chunky rhythms, the biting melody winds around and builds menacingly. The album's center piece is the 13 minute 'Nocturne' that begins deliberately, a free form melody stretching languidly over an ethereal harmonic canvas. Bursts of sound and grinding rhythms puncture the mood and lend texture and, in some sense, some a bit of danger. There is even what sounds like a nod to Hugh Hopper, perhaps unintentionally, in the song 'The Journey Beyond', which at points has thick, slow moving buzzing chords. This album is a expert mix of free and well established blues forms, replete with contrasts between darkness and light. It all helps paint a picture that is subdued at times and screaming at others. These songs, soundscapes really, are gateways to the introspection and stark reflections that can be encouraged by the quiet of the night. It really ranges from bluesy mood to metal-like pieces. And Nilsson's skills are more appreciable than in the Kalabalik trio with Raoul Björkenheim and Gerald Cleaver, I think. Thanks fot the review!